Group Discussion Ideas > General GD Topics > Should AFSPA be repealed? ‘Armed Forces (Special Powers) Act’, 1958 grants special powers to ‘Indian Armed Forces’ such as shoot on sight, arrest without warrant, search without warrant etc. in disturbed areas. Till July 2016, Armed forces had immunity from prosecution from courts for offences committed under AFSPA. A lot of human rights violation incidents were committed under AFSPA. This Act is against the spirit of democracy. United Nations (UN) termed AFSPA as a draconian law that breaches the current international human rights standards and asked India to repeal AFSPA. Public Interest Litigation (PIL) was filed in the year 2012. It mentioned that 1528 persons were killed with the misuse of AFSPA from 2000 to 2012. Solution by use of military forces for political problems may not solve the issue. Too much intervention of center in state affairs violates constitution principle. Cental government is renewing the act from time to time, without even consulting the states. Central government isn’t withdrawing the Act, even after the situation is under control. Instead of helping the police forces to deal with situation, Armed forces are totally controlling the areas and giving the local police a mere nominal role. Second Administrative Commission, 2005 recommended to repeal AFSPA. Santosh Hegde committee, 2013 reported that AFSPA is mandatory to achieve peace in disturbed areas, but the act should be reviewed fro every 6 months to check whether the Act is still necessary. Without AFSPA, local police may not be able to handle the overwhelming presence of insurgents in the areas, where AFSPA is in force currently. Separatist & violent groups will be at benefit as the state will be in the hands of local police only. Neighboring countries may take advantage of the situation, if there is no AFSPA. Some made-up human violation stories is targeted at Armed forces for their vested political interests. Tripura was successful in dealing with the insurgent problem with honest & transparent Government, even though it is covered by our neighboring country, Bangladesh on 3 sides. Remaining states, which are under AFSPA can follow Tripura’s strategy. The ordinance for AFSPA Act was first started by British to suppress ‘Quit India movement’ in 1942. After Independence, Indian Govt used this ordinance to deal with internal insurgent situation. This ordinance became Act in 1958 and was first implemented in Naga Hills area and then spread to the entire North-Eastern India. It was also implemented in Punjab & Chandigarh in 1983, but was withdrawn in 1997, as the situation there came under control. In 1990, AFSPA came under force in Jammu & Kashmir. 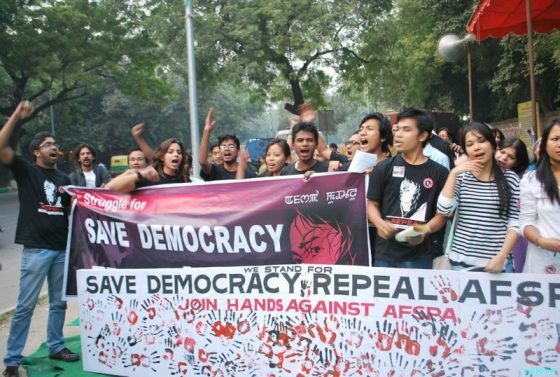 Tripura withdrew AFSPA in 2015, which was imposed there in 1997. ‘Irom Sharmina Chanu’, a social activist started doing indefinite fast as a protest in the year 2000 to repeal AFSPA. She took this decision, when ten innocent persons were killed by Assam Rifles. She continued her fast till August 2016, and is still fighting for the repeal of AFSPA. In July 2016, Supreme court ended the immunity of Armed forces from prosecution under AFSPA, by saying that personnel should be subjected to thorough enquiry if they committed offence. Violations are happening not just by Armed forces, but also by state & central police forces. AFSPA act should either be repealed or reformed. Strict measures should be taken to stop Armed forces from misusing the Act. And AFSPA should be implemented only in the problematic areas, instead of the entire state. Afterwords :- Do you support repealing AFSPA? What are your reasons? Express your opinions in the comment section below. This article is written by Debendra Nayak. All rights reserved @ Group Discussion Ideas.